19 appears to be connected with his availability as a witness. 20 This will be referred to in due course. 1 assist the Department in the running of the competition. 3 Thirdly, the choice of and design of an evaluation model. 7 leading to the announcement of the winner. 12 licence in terms to be negotiated. 16 the next entity, and so on. 23 those parts of it with which Mr. Andersen was involved. 7 the competition design raised by the European Commission. 29 briefly to recap on them. 2 ownership details for proposed licensee. 6 to implement the system if successful. 12 And I am just going to quote from that, sir. 3 Department to a completion date of 31 October, 1995. 11 ultimately the successful candidates. 21 marketing, technical, management and financial aspects. 11 the basis of an award of marks. 25 wide-ranging scoring of the qualitative evaluation. 30 maximise the validity and reliability of the results. 4 Department that the correct result had been achieved. 13 to be designed to assist in the quantitative evaluation. 24 agreed for the purposes of the Evaluation Model. 28 constituent indicators of the criteria fixed by Government. 6 (i) market development: 7.5. 7 (ii) experience of applicant: 10. 8 (iii) financial key figures: 15. 10 This resulted in an overall weighting of 32.5. 13 indicators were equally ranked with a weighting of 10 each. 24 to 100 instead of 103. 4 on a so-called soft scale from A to E.
13 Project Group on the adoption of the Evaluation Model. 17 final page of the Evaluation Model document. 25 Evaluation Model never seems to have proceeded. 3 assist the Tribunal in relation to this particular point. 3 evolve or change over the course of the evaluation? 19 quantitative results generated by Andersens. 24 assessment and the results of that separate assessment. 3 to produce a result. 26 role of the quantitative analysis? 27 basis of the four aspects scored. 1 grand total was arrived at. 9 to influence the eventual outcome. 14 Mr. Andersen in Copenhagen on the 28 September, 1995. 24 top-ranked applicants based on the qualitative assessment. 27 analysis appropriate and, if appropriate, was it reliable? 3 to this element of the evaluation, if any? 8 based on scores of 1, 2, 3, 4 and 5. 20 as to the consequences for the overall ranking. 15 had been considered and evaluated? 9 and what was its significance? 18 report, as apparently insisted on by the accountants? 28 within the Project Group as to what remained to be done? 1 result, and was this a course which he recommended? 2 delivered in the circumstances. 5 he availed of in December 2008. 8 Mr. Andersen through his Danish solicitors, Messrs.
28 himself available as a witness at the Tribunal’s sittings. 14 himself but through solicitors for Mr. Denis O’Brien. 28 to his attendance as a witness. 13 indemnifying him and associated companies. 27 referring to that history and background. 3 1. The question of costs. 4 2. The question of the impact of provisional findings. 8 available as a witness. 1 who reviewed it, and it was also sent to Mr. Tom Reynolds. 4 onwards distribution to the Tribunal. 25 incorporating them in a Memorandum of Intended Evidence. 29 receiving your client’s confirmation and that of Messrs.
30 of a company associated with Mr. Denis O’Brien. 22 as offered by Mr. Reynolds. 3 Mr. Denis O’Brien’s consent to its release to the Tribunal. 22 furnishing of his statement to the Tribunal. 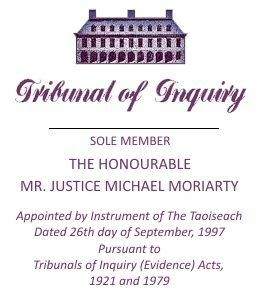 28 “Re Tribunals of Inquiry. 30 “Your client: Mr. Michael Andersen. 22 frankly, a nonsensical distortion of the true position. 10 of your client giving evidence, with an indemnity from Mr.
14 your letter under reply. 19 by making an order for production of that document. 28 client’s attendance as a witness. 7 solicitors, of that date. 17 “Our client: Mr. Michael Andersen. 19 “We refer to your letter of 15 September, 2010. 3 Mr. Andersen and Mr. Pals reviewing the statement. 7 2010. We have written to his solicitors in this regard. 21 but that the indemnity was limited to his costs. 28 indemnity. Later on the morning of 20 September, Messrs.
8 separate correspondence between the Tribunal and Messrs.
10 had not been informed of the indemnity until that date. 15 undertaken, since 2003, to be responsible for his costs. 23 evidence given by him to the Tribunal. 9 regarding his dealings with Mr. O’Brien’s associate, Mr.
11 to pursue inquiries to get to the bottom of those dealings. 14 the fact of that indemnity. 22 account ultimately in assessing the weight of his evidence. 6 generation of that statement.